The Georgia Tech Hotel and Conference Center is now fully booked, but there are still plenty of discounted rooms available at the Melia Hotel. The Melia is a short walk from the Scheller college of business and the conference center. Please click on the link below to make your reservations at the Melia. Located in Midtown Atlanta, the city’s hottest trend-setting neighborhood, Meliá Atlanta is perfect for weekend leisure and business visitors alike. Nestled between downtown Atlanta and Buckhead, Midtown is where people come to live, play, and work. With MARTA, Atlanta’s public transportation system, just across the street from the hotel and the highway just seconds away, getting to the hotel from the airport and getting to the center of town are both quick and easy. Melia Atlanta combines deluxe accommodations, a myriad of amenities and exceptional service to create an unforgettable experience. The hotel also serves as the perfect backdrop for business meetings, conventions and special events with 31,000 square feet of flexible meeting and banquet space with a signature 25th floor event space featuring unparalleled panoramic views. All around, Atlanta’s largest companies and universities take root: Coca Cola headquarters, Georgia Tech, AT&T, Emory, and Georgia State. Also near to the hotel are Atlanta’s biggest tourist attractions – The Georgia Aquarium, The Georgia Dome, World of Coca Cola, Philips Arena, The FOX Theatre, Turner Field and Centennial Olympic Park. 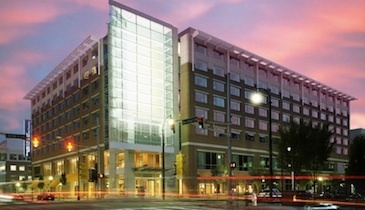 Located at the the heart of the Technology Square Complex – and directly across the street from the Scheller College of Business – The Georgia Tech Hotel and Conference Center has been selected as the 2013 AIB-SE Official Conference Hotel. Smart, stylish, and synergistic, the Georgia Tech Hotel and Conference Center is where sophisticated business and leisure travelers connect, inspire and entertain. Click on the link below to book your reservations for the Academy of International Business Annual Meeting held October 24 – 27, 2013. Rooms for meeting participants have been significantly reduced if booked through our website – so please take advantage of these savings! These reduced rates are on a first-come first-served basis so make your reservations early! Conference participants can also access the dedicated 2013 AIB-SE reservations link by logging on to the hotel’s website www.gatechhotel.com , clicking on the “Group Booking” button and entering the group password – “aib1013”) lower-case letters only. Both non-smoking King and two Queen bedding accommodations have been reserved for conference participants. Please note that all guestrooms are non-smoking. For any other requests or inquiries, please enter this information within the appropriate request boxes during the reservations process or call the hotel directly by calling (800) 706-2899 or (404) 838-2100. Hotel reservation’s hours are Monday through Friday 8am-7pm; Saturday 9am-5pm. We look forward to seeing you in Atlanta, Georgia in October! The number of rooms in the Georgia Tech Hotel and Conference Center is limited so you will need to act early to reserve your rooms. If you are unable to reserve a room at the official conference hotel you may also choose to reserve a room at the Melia which is a short walk from the conference venue.